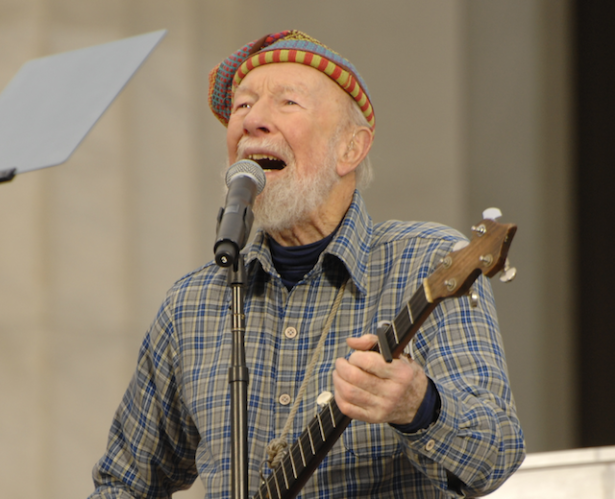 "I would not be here today if it were not for Pete Seeger. My parents met at one of his concerts during the red scare. I think that he was still blacklisted...."
On Monday, legendary folk singer and social justice activist Pete Seeger passed away. His death has sparked an outpouring of memories, reflections and tributes dedicated to a man whose music and lifelong struggle has inspired, and continues to inspire, generations of activists, artists, writers, educators, and other seekers of peace and justice. Waging Nonviolence editor Bryan Farrell, for instance, was inspired to write Seeger after seeing the 2007 documentary The Power of Song — which profiles Seeger’s life and, in particular, his impact upon generations of young people. At the time, Bryan was thinking of getting into teaching and asked Seeger for advice. He responded by saying, “Don’t preach to kids. Get ’em involved in stories, doing things, making things.” Now, in addition to editing for Waging Nonviolence, Bryan is teaching and he has the note — signed “old Pete” with a sketch of a banjo — framed by his desk as a reminder of how to be an effective educator. Seeger was a prolific communicator — slowing down only in the last few years with his fan correspondence (particularly as the letters piled up with recent tributes like The Power of Song, Bruce Springsteen’s 2006 covers album and a 90th birthday celebration at Madison Square Garden in 2009). But he left a legacy of memories that continue to inspire. Below are only a few of the thousands of stories of Seeger that have surfaced on social media, in emails and on telephone calls and are all shared with the writer’s permission. In 1986, I was in Iowa, halfway across the country on the Great Peace March, a nine-month anti-nuclear weapons demonstration. I wasn’t having a good morning. After 10 or so miles of walking I arrived at the lunch stop to discover a plastic bin of cold, broken hot dogs, a few bags of hot dog buns, and a big bowl of ketchup. As I stared at the mess, feeling sorry for myself, I heard a little sound behind me. Pete ambled up, took a hot dog, put it in a bun, and rejoined the march. I do not think I understood who I really was or what I wanted to do until I discovered Pete Seeger. To see him, at 92, leading a march down the center of Manhattan, uniting a crowd in song to champion the rights of ordinary people was a watershed moment in my life. He is the blueprint of an artist for peace in the United States and his gigantic heart will beat on inside the many of us who are fighting for the same vision. Kazembe Balagun, project manager with the Rosa Luxemburg Stiftung New York Office and contributor to Imagine: Life in a Socialist USA. As much of the debates on the Internet rages around cultural appropriation, maybe it is useful to remember that 1960s artists understood the power of the sharing. I’m just thinking about the number of Bob Dylan songs Black artists covered: The determination of “I Shall Be Released” by Nina Simone, the downright spookiness of “A Hard Rain’s Gonna Fall” by the Staple Singers and don’t even mention “All Along the Watch Tower” by Jimi Hendrix. Seeger’s cultural work will be remembered. The song, poem, painting, the protest, the rent strike, the boycott brings us back to the power of movements that incorporate shared values, not the same values. Seeger understood that the ability to share common ground gives birth to creative inspiration and movements that move. Pete was my mentor as a young artist, who had decided to put my own shoulder to the wheels of change for my generation. Pete gave me faith and courage to not be deterred or silenced in the face of my blacklisting after 9/11 when I could no longer get a gig in the United States music industry and when I was stopped at every airport to be searched because I put out a song of global love. He had been there himself. Pete himself convinced me to copyright my material when I was a young punk, chopping wood on the hill beneath his house in a light snow, telling me stories of Woody’s identical belligerence but convincing me on the need to make sure our songs would never be used for anything other than love, other than social, economic and environmental equality. To illustrate his point, as we chopped and moved large logs around the steep slope, he recounted how ABC named a TV show “Hootenanny” after the jam sessions Pete and friends were holding downtown without copyrighting the name. But whereas Pete’s gatherings with his friends had people of all races singing social justice songs, ABC’s show blocked performances of people on the basis of ideology and race. I went home. Three days later I got a letter from Pete with one of my songs, “It Rose From The Dead,” transcribed in his careful handwriting. Pete had attached a note, “Stephan, I have put a copyright symbol in the top right hand. If you don’t want it there, feel free to white it out. 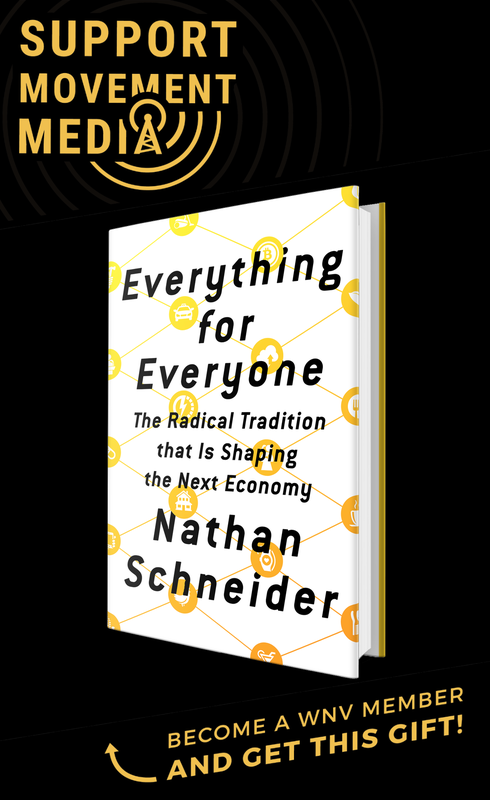 If you agree, just leave it and let me know so I can send this on to Joan and others.” You can imagine, as a 20-something-year-old living in a squat in the Lower East Side in the lead up to the Seattle demonstrations of 1999, I was honored. I left the copyright where he put it. I would not be here today if it were not for Pete Seeger. My parents met at one of his concerts during the red scare. I think that he was still blacklisted. My parents were undergrad students, my mom at Berkeley, my dad at City College in San Francisco. I remember telling Pete this story once and he was not as excited about this as I was. Throughout my childhood I was dragged to his concerts, up through my teenage years when my mother would tell me “We have to go see Pete Seeger again. He might die soon.” After a while, she stopped saying that. So we saw him perform countless, countless times. I sang backup for Pete with my chorus something like 15 years ago while my family sat proudly in the audience not so very long before my dad passed away. I still have a copy of the program that all of the performers autographed for my son. In 1986, Pete Seeger visited the hundreds of marchers walking from Los Angeles to Washington, D.C. on The Great Peace March for Global Nuclear Disarmament on more than one occasion. My most vibrant memory was when Pete dropped by to serenade us with the portapotties as a colorful backdrop! He embodied peace and justice — feet grounded, voice singing simple songs that raised awareness, eyes smiling and hands strumming his banjo and inviting others to join in. If the audience found truth in the words, they turned it up. If they believed the words, they would take the song and make it part of their world, or, in the case of “We Shall Overcome,” renew its place there. To me this is the essence of a musical power to the people. I am just beginning to carry the kind of songbook Seeger had, and hope to have as many years and places to share it as he did. We need more progressive rabble-rousers who are like Pete Seeger in this world today, and we need another Pete Seeger in the United States to show us the way toward equality, grace, and idealism.